As you may or may not know, I spent the past week frolicking around Montreal with my blogger BFF Alyssa. I’ve been anticipating this trip since we booked tickets back in May – not only because our main destination was a music festival, but because this trip signified “relaxing” for more than one day at a time; something I haven’t had the opportunity to do since returning from NYFW past February – which ironically, is where I first met her! It was a cold and snowy January morning. I impulsively messaged Alyssa on Facebook requesting she book a flight to join Bianca and I in our ~fashion~ adventures. Prior to that, we had probably exchanged a total of 100 written words – half of which were by email in regards to a failed Toronto trip (so meta). Blogger friends are weird because you automatically feel like you have ~a bond~ with them, even though they are literally pixels on your screen. Anyway, to my surprise, Alyssa obliged…and within a couple of days, she informed me her trip to The Big Apple was booked. Though I saw her for probably a total of 5 hours over the course of 3 days, I knew we were destined to be IRL biffles – so a subsequent and dedicated DANI AND ALYSSA /vacay/ seemed appropriate. After spending a consecutive 7 days with my Edmontonian ladyfriend, it’s safe to say that sitting back home at my dining room table, I am officially in Alyssa-withdrawl. 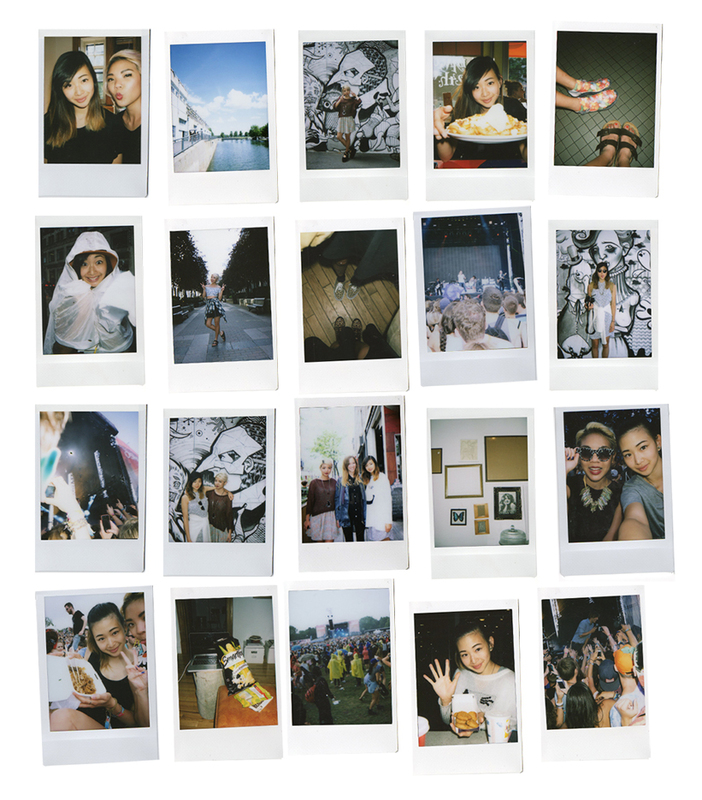 To celebrate this newfound sadness in my life, the above are snaps that I took throughout our trip using my new favourite toy, the Fujifilm Instax. And what do said pictorial situations depict, you ask?!?!?! We started our trip off at La Banquise for some artery-clogging poutine, eventually ended up on Sainte Catherine St. where we bought matching baseball hats and ate Subway subs in torrential downpour (while wearing matching sun hats and leopard sneakers), and of course spent time perusing the wonder that is Old Montreal (while I showed off a really bad sock tan). Somewhere in between we went to Osheaga; touched(!!) Thomas Mars aka Mr. Sofia Coppola from Phoenix as he crowd surfed, judged Icona Pop as they played questionable songs, and danced/rapped through Kendrick Lamar’s entire set (no shame). We also had brunch with our new friend Gabrielle and spent two evenings in a row watching Miss Congeniality 1 and 2 while eating peach rings, Hershey chocolate bars, and SmartPop white cheddar popcorn. Alyssa also convinced me it was a good idea to buy a family-sized box of Cheerios and 6 cartons of berries, but I guess that’s a different story. When we weren’t doing all of the aforementioned adventuring, we were at our AIRBNB-rented apartment in Westmount watching videos of cute dogs, reading alarming scary stories on Thought Catalog, and bonding over eeriely-similar holiday traditions (including but not limited to Clay Aiken’s Christmas album). At one delirious point we also harassed/confused Edward via Facebook – so Ed, if you’re reading this, hi and also sorry. By Dani Roche on August 7, 2013 at 10:42 pm | Posted in photo diary and tagged airbnb, alyssa lau, canada, edmonton, edwardshair, icona pop, kendrick lamar, la banquise, montreal, ordinary people, osheaga, phoenix, thomas mars, toronto, westmount. This is probably my tenth time saying this, but I miss you. Brb dying. i’m totally green with envy right now. i could honestly kill for a girl’s day out and some poutine.